Handy Home Blog provides information about home warranties and home improvement for homeowners, real estate agents and property owners. Handy Home Blog is run by Landmark Home Warranty in order to provide helpful DIY repairs for appliances that our home warranties might not cover. The blog is also used to educate our customers on things they can do to make sure their appliances only fail from normal wear and tear, so their home warranty can be properly used. 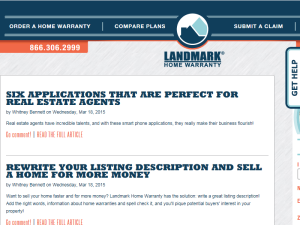 Landmark also uses the blog as a space to provide infographics and articles for real estate agents, so they can educate their clients on what home warranties are, and why they can be useful for homeowners, sellers and buyers, if they choose to purchase one to protect their home. This what your Handy Home Blog Blog Ad will look like to visitors! Of course you will want to use keywords and ad targeting to get the most out of your ad campaign! So purchase an ad space today before there all gone! If you are the owner of Handy Home Blog, or someone who enjoys this blog why not upgrade it to a Featured Listing or Permanent Listing?